Camilla Chappers: Hansel and Gretel Witch Hunters red-band trailer! Now this is one film I really don't know what to think of. A spin on a classic fairy tale - yes the fairy tale characters Hansel and Gretel are now supposedly 'witch hunters' with this new film out early next year starring Jeremy Renner and Gemma Arterton. Wanna see the trailer? Here is the new red band version, so a word of warning among the splatter of blood. 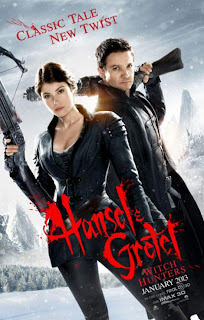 The plot is basically after their traumatic experience as children at the hands of a witch Hansel (Jeremy Renner) and Gretel (Gemma Artherton), decided to hunt witches in revenge. The mayor of Augsbury recruits to get rid of evil sorceress Muriel (Famke Janssen), who is planning to sacrifice local children at a witch gathering of some sort. No idea what to think? Don't worry your not the only one - I feel the exact same. I think it is a good idea in some respects; a modern twist on a classic fairy tale, where Gretel and her brother Hansel hunt witches instead of killing just the one witch, they kill multiple. It's a fresh idea, one that hasn't been used at all really in the film industry. But for that reason, will it be a hit or miss? I really don't know. With this new trailer, the gruesomeness of the film is shown. I had heard stories before this that the film was going to be almost Quentin Tarantino type blood and guts, so this film will obviously not be for the faint hearted. This film is clearly not going to be rated PG, and the gore is all a little OTT, with not much seriousness. It really is a little bit daft - the story line doesn't sound too great and has chunks in numerous places, and I didn't think much of the action either; that may change by the time the film actually comes around but at the moment, it all seems a little bit... well I don't really know how to put it! I thought with the first viewing of the first trailer that it'll be a miss, and it'll be a shame if that is the case. It has got a pretty good cast - Jeremy Renner in my opinion is one of the best actors around at the moment and Gemma Artherton is an all-round good actress. To be honest, I think Jeremy Renner and his charisma shown so far in these trailers may just boost the film up a tad. I just get a sense that this film won't be popular - it seemed almost daft at times the trailer with the plot and the whole story line of hunting witches. I know it's an old fairy tale, but does it need extending? But it could be just what the film industry needs - a daft yet gruesomeish film to spice things up a little bit. Who knows? It may be popular, it may draw in the crowds. But I just have a feeling that this is one film that won't last in the memories of many film goers. What do you think? As always, comment below for your views! Hansel and Gretel Witch Hunters is set for release on the 25th of January 2013.